Judaica Wall Hanging T1010H. Judaica Measurements 11.5 X 14 Inchs. 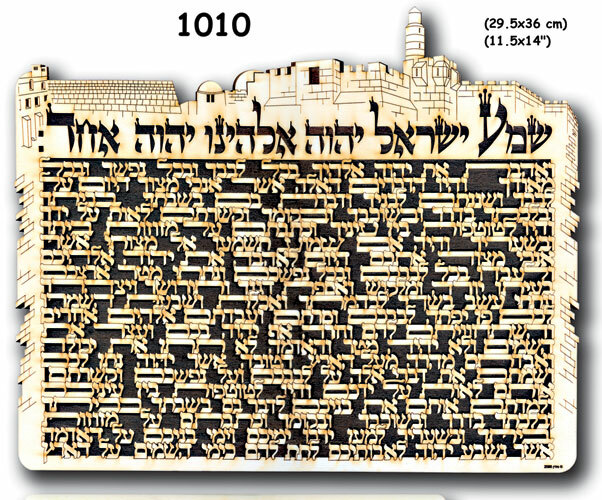 Design: The old City of Jerusalem and the Tower of King David. Made of Wood. Special laser cut. One of a Kind Judaica. 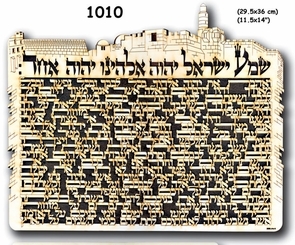 Hear of Israel, Shema Israel Jewish Prayer with Biblical font. A great Judaica Gift. Made in Israel. Shipped from Israel. Kosher Approved. Try our gift wrap service. We will ship it with love and care. Hear, O Israel: the Lord our God, the Lord is One. You shall love the Lord your God with all your heart, with all your soul and with all your might. And these words which I command you this day shall be on your heart. You shall teach them to your children, and you shall speak of them when you sit in your house and when you walk on the way, when you lie down and when you rise up. You shall bind them as a sign upon your arm, and they shall be for a reminder between your eyes. And you shall write them upon the doorposts of your house and upon your gates.